There are many oral consequences of tobacco use. Smoking alone causes mouth sores, ulcers, gum disease, and oral cancer. Additionally, smoking affects both those who smoke as well as those exposed to second hand smoke. Fifty percent of smokers have periodontal disease. Smoking causes people to be more susceptible to poor gum health and bone loss within the jaw. Therefore, those with periodontal disease are more likely to have problems with tooth loss. 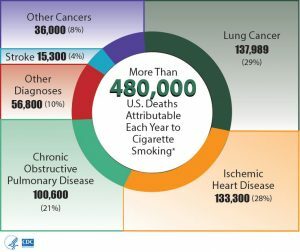 Tobacco use is the cause of 80-90% of all cancers. Oral cancer is not the only type of cancer or systemic disease that tobacco use may cause. As seen below, the use of cigarettes is the cause of over 480,000 deaths annually. People who smoke have an increase in dental plaque which causes cavities in teeth. Consequently, cigarette smokers are twice as likely to need root canal therapy. Nicotine and tar in cigarettes cause teeth to discolor. Cigars, chewing tobacco, and snuff also contain tiny particles that are abrasive to teeth. Therefore, when mixed with saliva and chewed, an abrasive paste is created that wears teeth down over time. Persons who smoke have a more difficult time healing from dental surgery or extractions. Smoking impairs blood flow to the gums to promote wound healing. Smoking alone causes patients to have bad breath. In addition, those people who are battling periodontal disease also have problems with bad breath. Women who smoke may be more likely to have children born with cleft lip or cleft palate. Children exposed to tobacco smoke may have delays in formation of permanent teeth.